Today, we’re taking a little pause from all the frantic baking activity, and I thought I would share something that I’ve been working on with my London-based designer friend Ursula. You might already have seen some of here work at Seagull’s Eye or perhaps from my Instagram pictures (yup, that’s her stuff on my walls). Over endless cups of coffee and the occasional mulled wine, we noticed the interesting shapes of a variety of traditional Christmas biscuits, cakes and cookies from around Europe. The diversity of how each country celebrates at this time of year reflected in cake form. This triggered an idea – what if we used this as the basis for some illustration? – and we’ve been working away on an art print which I think shows these off to really great effect. This print features twelve different festive treats from around the Continent – Vanillekipferl (Austria), Speculoos (Belgium), Honninghjerter (Denmark), Joulutorttu (Finland), Zimtsterne (Germany), Beigli (Hungary), Kerstkransjes (Netherlands), Mor Monsens Kake (Norway), Coscorões (Portugal), Lussekatter (Sweden), Spitzbueb (Switzerland) and last but certainly not least, our very own British Gingerbread Man. We’ve tried to cover off cakes, biscuits, spicy, sugary, colourful, fruity and nutty, and I think the nibbled Danish heart and the cheeky Gingerbread Man add a little extra charm too. If you’re tempted by this design, move quickly – we’ve done a limited run, but you can pick on up from the online store here. I hope you like this! If you want to try making some of these recipes, you can find them on my recipe index. I’ve made most things on here, but you’ll need to be patient if you want to enjoy poppy-seed Beigli, jammy Joulutorttu or fried Coscorões as these three are still on my to-do list. Enjoy! A couple of weeks ago I made a batch of speculaaskruiden. 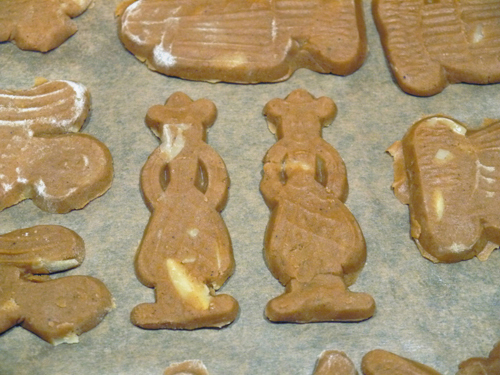 Now here is a way to use them up – Dutch speculaas cookies! I feel I need to point out that these are not strictly Christmas biscuits per se, as you can get hold of them all year round, but the crisp buttery spiced flavour does suit this time of year particularly well. Imagine yourself sitting on a café terrace on an old market square on a chilly day in December, coffee or mulled wine in one hand, and one of these cookies in the other. 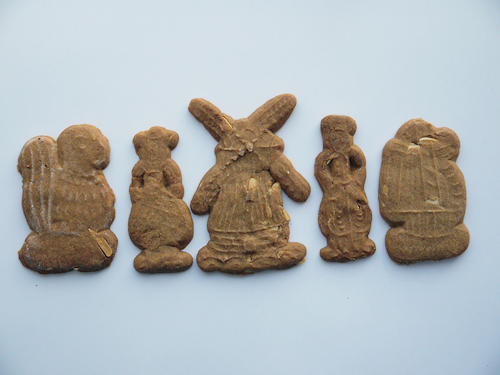 Now, this post has a number of interesting things related to speculaas. To start with, this is a very special recipe. It’s not one that I made up, nor it is one that has come from some random website. 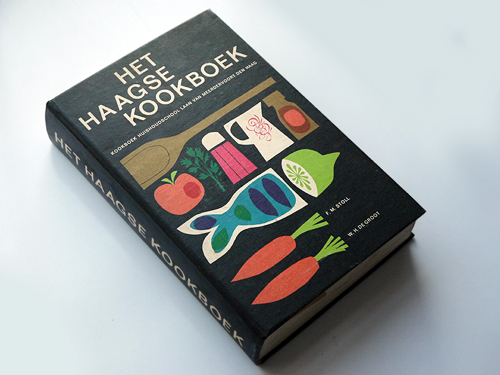 Nope, it comes from Het Haagse Kookboek (“The Hague Cookbook”). 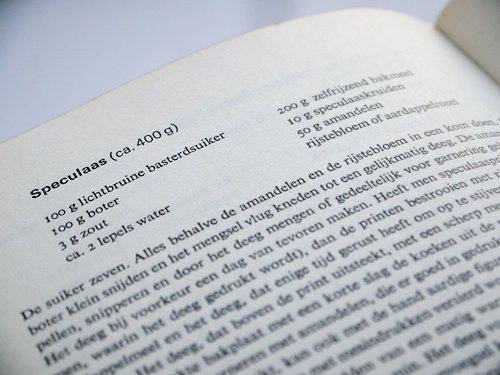 I am assured that this was, back in the day, basically the cookery bible of Dutch housewives. As you can see below, the version I have had access to is clearly from the 1970s, and I love the retro front cover. Another interesting aside is that the origin of the word “cookie” also links back to the Dutch. It isn’t a British word – we have biscuits, cakes, tarts, traybakes and so on. But the cookie is an American “thing”. It comes from the Dutch word for a small cake. Cake is koek (say it like “cook” in English), then make it small by adding the diminutive ending -je – and that’s how we get to koekje (say “cook-ye”). My unwavering belief that speculaas is a legitimate festive bake is also supported by the fact that it appears in the window displays of lots of bakeries and chocolatiers in Brussels. These range from the size of your palm to the size of a small child (really). My favorite is from Maison Dandoy. If you are there, do go in and enjoy the aromas and flavours. 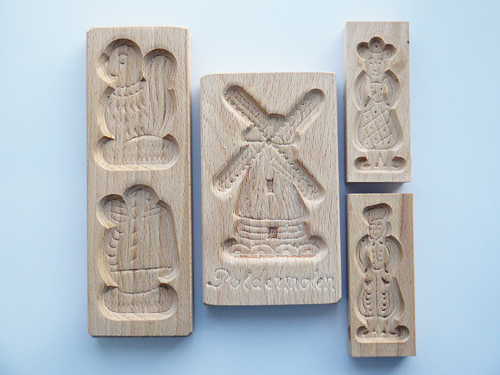 You may also wish to buy something, mainly because you will go nuts thinking about speculaas after you leave there. That’s the background, the theory and the linguistics lesson. How are they to make? The recipe is pretty easy – put everything in a bowl, work to a dough, allow to chill and that’s it! OK, that’s not quite it. If you are making these in the proper way, you use a type of sugar the Dutch call basterdsuiker. Yes, very giggle-inducing, but it turns out to be a sort of brown sugar. I’m not sure there is an exact substitute in Britain, but I used soft brown sugar and they worked out a treat. 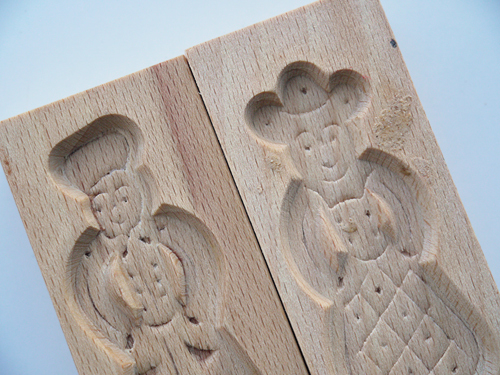 But…but…we just have to admit that the real fun is using the moulds. No messing around with a rolling-pin. Just press pieces of dough into the moulds, then flip them over and whack them on the table to release them. And there we have it – lots of little gingerbread people, birds and windmills! I do have to admit that these cookies were the result of some trial and error. The moulds were new, and probably need to be “seasoned” or similar. At first the mixture stuck badly, but I think after a while, the butter made for some sort of natural non-stick, and combined with a light coating of flour, they started to come out very easily indeed. By the end, we were experts! And…after all that…here are the finished biscuits. Not quite as perfect as they looked before going into the oven, but they taste great – crisp, spicy and buttery – and they do have a certain rustic charm. 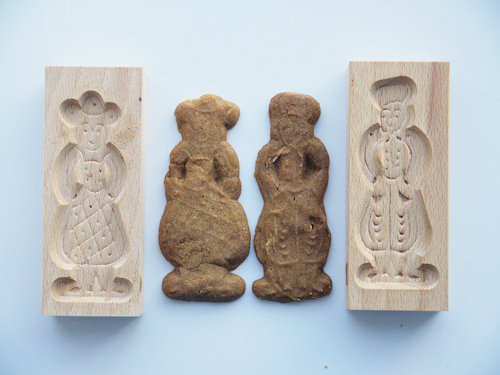 If you are tempted to have a go but lack suitable moulds, then have a look at this great version of speculaas from a Dutch girl living in London (here). Sieve the sugar to get rid of any lumps. Put the sugar, butter, flour and spices in a large bowl. Use your hands to rub the ingredients together until they resemble breadcrumbs. Add just enough cold water (1-2 tablespoons) until the mixture comes together into a smooth dough. Work in the flaked almonds (if using). Wrap in cling film and chill for two hours or overnight. Preheat the oven to 160°C (320°F). Line a baking tray with greaseproof paper. 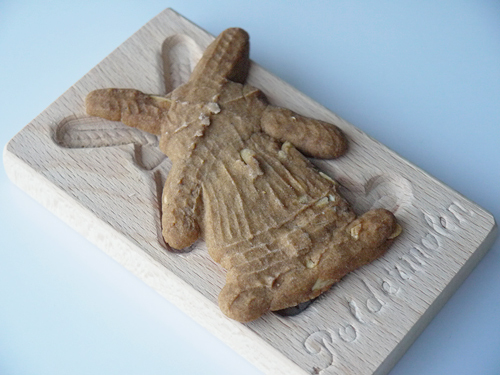 If using speculaas moulds: sprinkle the moulds with flour, tap out any excess, then press pieces of dough into the moulds. Then – in theory – they should come out of the moulds easily when you flip them over. Arrange on the baking sheet at least 2 cm apart. 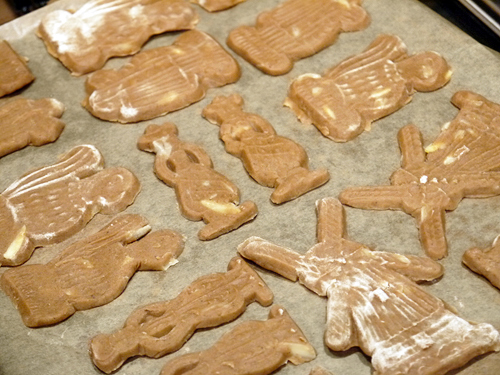 If you don’t have the moulds: roll the dough out to 1/4 cm thickness and use cookie cutters to shape the speculaas. If you like, brush them with milk and sprinkle with some more flaked almonds. Arrange on the baking sheet at least 2 cm apart. Bake the cookies for 25-30 minutes until the speculaas are firm, but have not started to darken. Worth making? This is a very quick, straightforward recipe, and the resulting biscuits are great on their own, or can be used crushed over desserts, in crumble toppings or as part of a biscuit base for cheesecakes. You can also vary the spices depending on what is to hand and your own preferences – not bad for cookies made from simple ingredients you’re likely to have to hand! If you’re going to make festive biscuits, you need to get spicy! 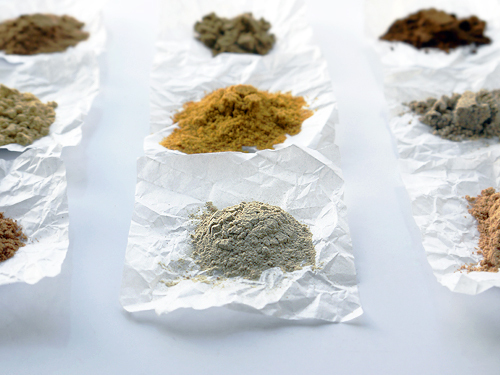 Hence the second part of the “Twelve Goodies of Christmas” is a traditional spice mixture from the Netherlands. Last year, I made a batch of German Lebkuchengewürz. Rather than trying more of the same, this year I’ve taken some inspiration from further west, and made a batch of Dutch speculaaskruiden (speck-oo-lass-krau-den). My last mixture served me well over the past year, in everything from biscuits to fruit pies and compotes. So if you’re a little apprehensive about making a batch of mixed spice on the basis you won’t use it all, don’t worry. A little pinch of these sort of mixtures will add a lovely gingerbread flavour in place of plain old cinnamon. 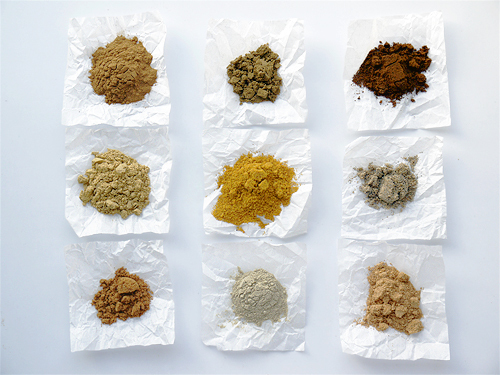 I know that you would not normally arrange spices on neat little paper squares, but I found it quite interesting to see how the colours of each spice vary, and as you work with each, the different aromas will fill your kitchen with the most wonderful warm, woody smells. The warmth of cinnamon and ginger, pungent cloves, fresh cardamom and coriander and aromatic nutmeg, star anise and mace. 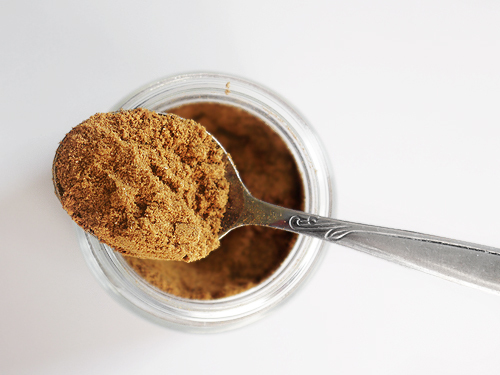 In making this, I used ground spices for a number of the ingredients – I’ve tried to grind cloves before, but they are tough little fellows, so you end up using a coffee grinder, and frankly – you’ll never get rid of the smell! Fine if you happen to like spiced coffee, but I don’t. So for the really tough ones, I buy pre-ground. However, I did grind some of them myself – the cardamom seeds were tackled with a mortar and pestle, while the nutmeg and star anise got the grater treatment. Just be sure to pass them through a very fine sieve, so you get rid of any woody bits of spice. 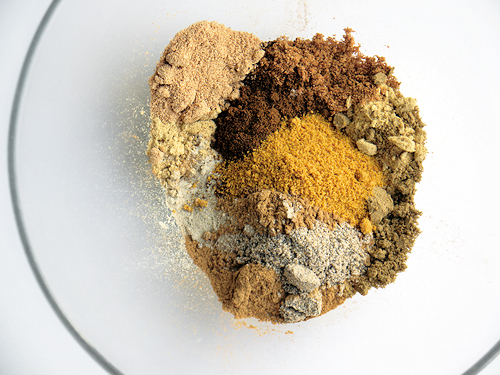 What you will notice when you compare the Dutch and German recipes is that they use many of the same basic spices – cinnamon, cloves, ginger and nutmeg – but in different proportions. And just as with so many spice mixtures, there are dozens of recipes and many people have their own ways of making them. So treat the list below as a guide, and adjust the amounts as per your preferences. For the authentic flavour, you need to add the cinnamon, cloves, mace and ginger, but add or omit anything else that takes your fancy. Now, the big question – what to make with this mixture? Well, speculaaskruiden is the typical flavour in a number of biscuits – speculaas in the Netherlands, speculoos in Belgium and Spekulatius in Germany. As the names suggest, these are similar types of biscuit – they’re crisp, buttery, sometimes with almonds, and with lots of spice. While they are eaten all year round, they do tasty particularly festive. That, or add it to cakes, muffins, carrot cakes, crumbles, compotes…whatever your imagination can come up with! Put everything in a bowl. Mix well – that’s it! Store in an airtight jar in a cool, dark place. Worth making? This mixture is fantastic – different notes come out from the different spices, and adds a pleasant spicy note to many recipes. If you’ve got this to hand, it makes for an easy way to add a rounded spiced flavour to just about anything. Really recommended. Today’s post is a very simple but delicious dessert I whipped up recently while staying with friends in Brussels. And boy, do I mean simple. For regular readers, this might look rather similar to something I posted last year using some luscious crimson Victoria plums. And you would be right! But this time, I replaced the plums with pears, and glazed it with maple syrup rather than honey. I went for maple syrup for no other reason than it was to hand, in a one-litre bottle. Yup, people really do buy it in those quantities, even in Europe. So just how simple is this? Well, think about it element by element. The pastry? Rich butter puff pastry…but we got that from a shop, and it was handily already rolled out into a thin disc. Result! The filling? Ripe pears, just peeled, sliced and artfully arranged on the pastry. And to finish? 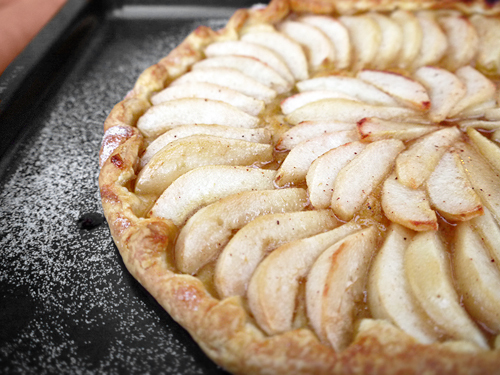 A mixture of butter, maple syrup and mixed spice(*), melted together and brushed over the tart. Then it was a light sprinkling with sugar, bake, and that’s it. All in all, this took about 15 minutes to make. That would be, 15 minutes to make not including time for me to stab my hand with a sharp knife while chatting. I had just finished slicing the pears and arranging them on the tart, and then I genuinely have no idea how this happened. All I know is that it was quick, painful and dramatic. There was a shocked gasp from the next room. Are you alright? I was indeed alright, but the sympathy soon evaporated as the others realised that the tart was quite unaffected by all this, and I was dispatched to a kitchen stool with a glass of wine, instructing someone else to finish the tart. Lesson learned! To serve, I would not produce this straight from the oven. Rather, either enjoy it while just warm, or at room temperature, with a generous dollop of whipped cream or vanilla ice cream. Simple, but delicious and just a little bit classy. (*) We used a Belgian spice mixture called speculaaskruiden (spek-oo-lass-krow-den) in Dutch or épices à spéculoos in French. It’s a mixture of cinnamon, nutmeg, cloves, ginger, cardamom and white pepper. However, mixed spice or even Christmas Lebkuchengewürz can be used instead. Place the pastry on a baking sheet. Use your fingers to crimp the edges. Peel the pears. Cut into quarters, remove the seeds and core, plus any stalk fibres, then cut into slices. 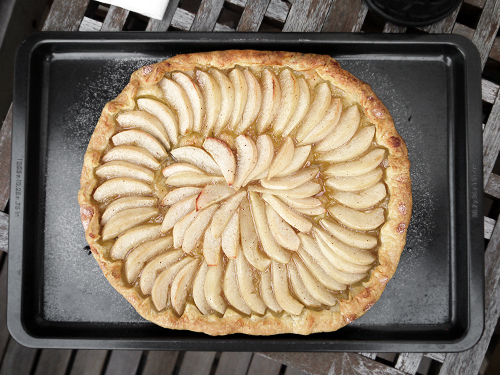 Arrange the slices in an overlapping and artistic pattern on the pastry, pushing them slightly into the pastry. To make the glaze, put the butter, maple syrup and mixed spice in a saucepan. Heat until just melted, then brush it over the pears. Sprinkle with a little caster sugar. Bake the tart for around 20 minutes until the pastry is golden at the edges and the pears are just browning (you might need longer, depending on your oven). Worth making? This is one of the quickest, simplest desserts you can make, and it’s easy to do with things in the cupboard, fridge and the fruit bowl. It’s also easy to change depending on what you’ve got to hand.